I'm part of an insurgent research group working on the Anthropocene Atlas of Geneva, and London (TAAG and TAAL). Sensing large scale climatic changes and understanding how human activities are influencing these changes, is complex and challenging. As a result, we are working on micro-investigations in the city, developing local indicators, indicators we have learnt to call erratics, of long term climatic change while identifying institutions and communities experimenting with resilience to the changes to come. You can read about the first walk. As part of my research, I visited the Horniman Museum in South London. On the mezzanine floor are dispaly cases that represent - through the display of British fossils - the periodisation of geological time. As you walk the floor plan, you walk our narration of the history of our planet from roughly 500 million years Before the Present (BP). When I got to the Eocene, 56 - 33.9 million BP, a time characterised by a moderate, cooling climate, the appearance of several modern mammal families - like primitive whales, the first grasses, the reglaciation of Antarctica, the laying of the formation known as London Clay - which indeed much of London is built from and over, and the settlement and decay of seafloor algae which sequestered massive amounts of atmospheric carbon dioxide, I noticed a temporarily removed from exhibition notification, indicating that three palm fruit fossils from the Isle of Sheppey, are missing from the display. The card is dated 6th October 1995 and signed by L.A.Patrick. 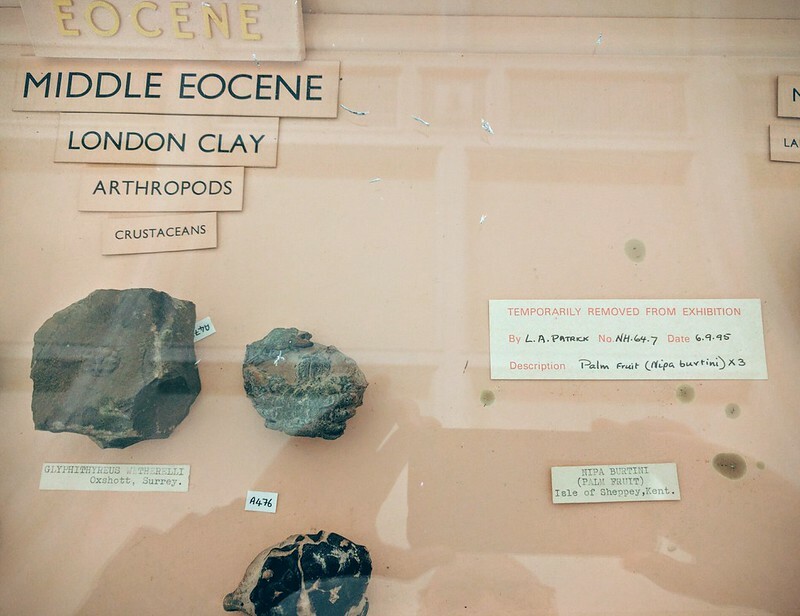 The fossils have been temporarily removed for 21 years (currently), I was momentarily piqued, 'huff, look at the lack of care and attention in this display' until I reaslied that I was still in the Eocene. Temporary, momentary and missing are all relative.